Paw Bar takes pampering your pet to a whole new level, with bubble bath for dogs, a cafe serving freshly made pet food, and grooming services. The bubble bath service for smaller dogs (29 kilos and below), is touted to be the first in Bangalore, and steals the show here. A machine that works like a sauna will ensure your baby's fur and skin is cleansed well. Reduced skin odour and hair shedding are the benefits along with de-stressing your pet. See, a bubble bath isn't just for hoomans! 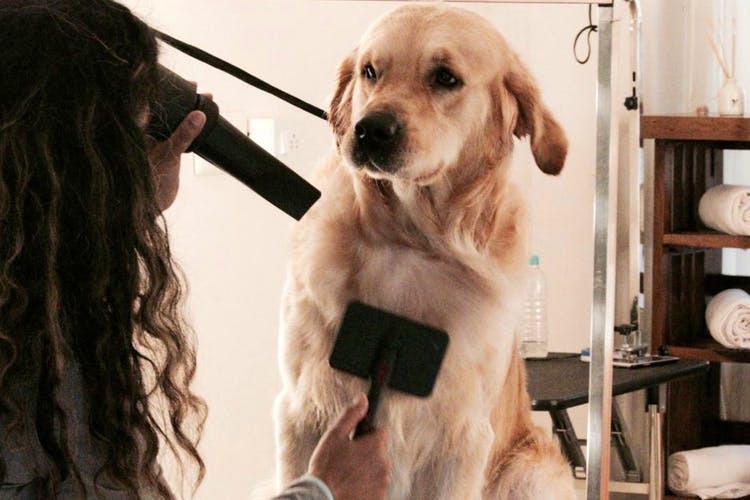 They also offer regular grooming services including pawdicures, coat cutting, wash & blow dry, essential oil massage and facials. The salon houses a dedicated cafe that serves pet food, smoothies, treats, and cakes all made-to-order and fresh. The pet food is made to suit the dietary preferences of your dog, so even fussy eaters won't mind. It also sells packaged food as well as snacks and drinks for pet parents who are waiting for their pooch. It's a house converted into a salon, so expect cosy nooks to wait at like the space upstairs that comes with books and board games. There's WiFi packages too that allows pet parents to work or chill while their pooch is getting pampered.